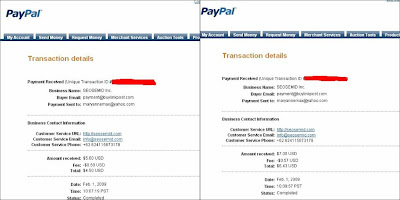 I am so happy tonight because I just received two payments through paypal from BuyLinkPost.com. Earn Through Your Blog - LinkPost Today! Get Hold Of Your Reading Festival Tickets Through Seatwave Now! The first post (worth US$5) was written and submitted on 28 January 2009 while the second one (worth US$7) was composed and submitted to them the following day. Just after 4 days, they already paid me directly to my paypal account. That's something really good! The good thing about BuyLinkPost.com is that, bloggers like me do not need to wait for 30 days just to get paid. After you have submitted your article through e-mail, you only need to wait for 3 to 4 days to know if it's approve or not. It the advertisers approve your blog, you will receive the payment for the job the same day. It's actually very easy to work with them. All you need to do is sign-up and wait awhile until you receive an e-mail from them accepting your application. You will then be receiving jobs through your e-mail so be sure to check your e-mail from time to time. hi Maxi, thanks for stopping by.. i already added you up. btw, i signed up for this now too and i have you for my reference..hope you don't mind... if you have time please feel free to visit my other blogs too...thanks ahead!